COYOTES, SWANS AND TURKEYS OH MY! At the recent White Lake Township Board of Trustees meeting, Supervisor Rik Kowall shared that in the lakes area the coyote population is rising, the orange beaked swans (Mute Swans) are invasive species to the area’s lakes and that a turkey would win in a fight against a coyote. According to the recent Urban Wildlife Management report by DNR Wildlife Biologist Julie Oakes, consensus on management is impossible. Oakes suggests that communities should incorporate both biological and social input, have appropriate management strategies that align with objectives and that all management action need to be maintained over time. For example, with the Mute Swans, the report notes that they are a growing threat to native animals, habitats and humans. There is no protection under federal law for this aggressive species. They have been known to attack people in both boats and on shore creating potentially dangerous conflicts as they show little fear of people. 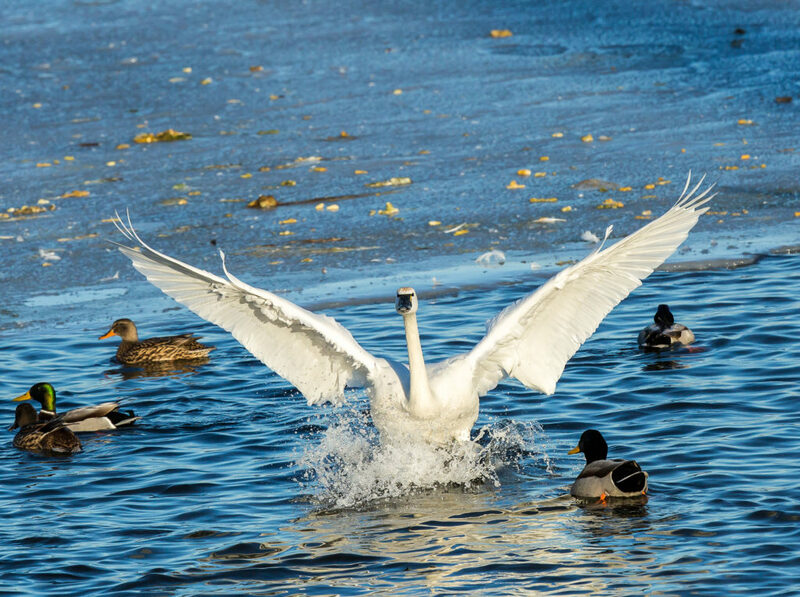 A few organizations that support swan management are The Michigan Audubon Society, Ducks Unlimited, and The American Bird Conservancy. For goose and swan programs, apply on the DNR website. Eligible participants require lake/site with multiple owners with a petition of 70% of lakefront landowners signatures or a local government resolution. Permits are valid for five years. Based on a recent meeting Kowall had with Oakes, he reported that, “We’re seeing a very, very high rate of growth in coyotes,”. He then went on to say, “There are definitely benefits to coyotes. They keep the rodents down. They are not a real threat to turkeys. They (turkeys) have been known to kill coyotes,”. In response to the gasps of surprise from the attendees, Kowall remarked, “It’s true! Right from the DNR,”. In a comment relating to the recent announcement of year-round hunting being permitted by the State, Hannah Schauer, a wildlife technician with the Michigan Department of Natural Resources said, “The State doesn’t track coyote numbers, but they are everywhere in Michigan. This is the time of year when people are likely to see and hear them. That’s why we wanted to give people a reminder. It is breeding season, so they are much more visible right now, more vocal, moving around,”. Information from the Oakland County Blog (oaklandcountyblog.com) suggests that, coyotes play an important role in the ecosystem of Oakland County, helping to keep rodents, small mammals and the golf course as well as lakeshore loving Canadian geese populations under control. They are by their very nature fearful of humans; however, if coyotes are given access to human food and garbage, their behavior changes and they become bold. The DNR wants to minimize potential conflicts between people and coyotes. They want to remind communities that people can discourage coyotes from hanging around by removing food sources such as trash bins, bird feeders and pet food and by fencing off gardens and fruit trees. Additionally, experts suggest that if a coyote is encountered and does not quickly flee, never, ever run away. Running can provoke an instinctive predatory response from a coyote. They expressed that one should stand their ground. Yell at the coyote. Throw anything, except for food. The coyote will flee with a strong reminder that humans are a threat. Coyotes are a member of the dog family, are extremely adaptable and survive in virtually all Michigan habitat types. They are found in urban areas and often go unnoticed. Coyotes live for six to eight years in the wild and mated pairs can produce three to ten pups annually. The average range of territory covered is eight to twelve square miles. Coyotes can be difficult to distinguish from a medium-sized German Shepard dog from a distance. There is a wide variation in the coyote’s color but their upper body is yellowish grey and the fur covering the throat and belly is white to cream color. The coyote’s ears are pointed and stand erect, unlike the ears of domestic dogs that often droop. When observed running, coyotes carry their bushy, black-tipped tail below the level of their back. Kowall concluded and reiterated to White Lake residents what the DNR suggests, “If you have them near your house, don’t feed them, don’t leave things out and be mindful of your trash. If you see them in your yard, yell at them and shoo them away,”. Copyright 2019, Jake Ryan Landscape Group LLC, All rights reserved.